“Somebody suggested it was too much for me”, says the man with a mission to swim just over 80 miles in memory of his parents who both died of vascular dementia. 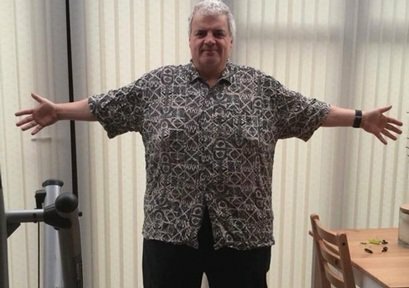 Fifty-nine year-old Chris Larkin had originally planned to swim 62 miles to fundraise for Alzheimer’s Research and lose 12 stone in weight “but then somebody suggested that it was maybe too much for me and that I shouldn’t be disappointed if I didn’t make it. The grandfather of three, who topped more than 36 stone two years ago, has been clocking up the miles in the Village Hotel pool since his swimming challenge began in May. For the final mile, he intends to swim in the sea from Boscombe Pier to Bournemouth Pier on 31 August. Mr Larkin, who works as a lighting engineer, is happy to fundraise for a cause “that’s so close to my heart”. A knee injury prevented Mr Larkin from running in the dementia charity’s Running Down Dementia campaign, which challenges people to run 100km throughout the summer and so he decided to take to the water instead. “I saw Running Down Dementia on Facebook and I thought ‘damn, I’d love to do that’. My physio had suggested I do aquatherapy and then I thought maybe I could do the challenge in the pool. Mr Larkin began piling on the pounds in his mid-30s when his lifestyle became more sedentary after taking on a new job as a sales rep.
“I was a very fit guy in my 20s and early 30s. I ran a marathon, I used to run five miles every other day, I would cycle 25 miles at weekends and played squash regularly. But I never ate well, I’d eat whatever I wanted. A back injury in 2015 set him back further because he “could barely walk” for eight months. “I reached my heaviest weight in June 2016 – 512lbs [36.5 stone]. At that weight I thought my life was over, it was awful. The avid swimmer now hopes his big swim will help him slim down to 15 stone. Mr Larkin may not be able to run due to a knee injury but this summer, his swimming efforts mean he will join nearly 5,000 people fundraising for Alzheimer’s Research by taking part in Running Down Dementia campaign. Mr Larkin will be joined on his pier to pier swim by four coaches from across the UK, who he has not met but who were inspired to join him after hearing about his story. “We are in awe of Chris and his amazing weight-loss journey. It is brilliant that taking on the swimming challenge and fundraising for dementia research is helping him in his weight-loss mission”, said Julia Sobik, senior sporting events and partnerships manager at Alzheimer’s Research UK. Chris Larkin’s swim has so far raised £706. To sponsor him click here. Leymar Healthcare provide Homecare Services in Ashfield and 24 Hour Live in Care in the UK to vulnerable adults in their community. Please contact our office on 01623 360 193 or email us at info@leymarltd.co.uk.